The St. Louis Cardinals and the Cordish Companies broke ground this morning on Ballpark Village, a mixed-use development on 10-acres adjacent to Busch Stadium. A group of team officials, project participants, and civic leaders commenced work on the $100 million first-phase of the development with the symbolic turning of dirt with commemorative shovels. Ballpark Village will serve as an entertainment center for the region, attracting 6 million-plus visitors year-round. The $100 million first phase also includes all of the streets, parking and site infrastructure to support the future phases of the seven-block mixed-use project, allowing the city to market pad-ready sites ripe for development. The development team expects future phases of Ballpark Village to include additional retail and entertainment venues, as well as commercial office space and residential units. 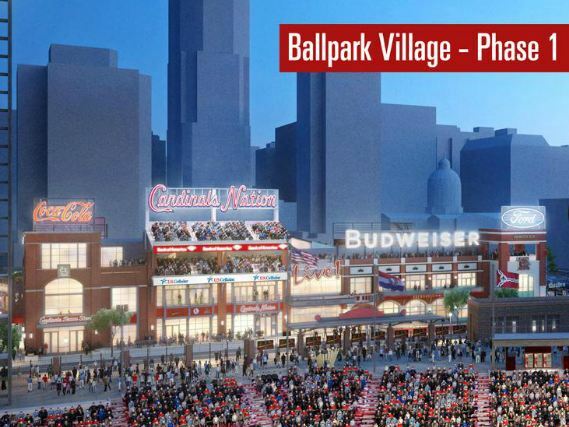 The construction of Ballpark Village represents the next step in the Cardinals’ vision for their investment in downtown St. Louis that began with the opening of the privately financed, $411 Busch Stadium in 2006. Ballpark Village is a mixed-use retail, entertainment, office, and residential district being developed in partnership by the St. Louis Cardinals and the Cordish Companies. Spanning seven city blocks on the 10-acre site just north of Busch Stadium, Ballpark Village will be the country’s first fully integrated mixed-use development designed to deliver the excitement and energy of the game day experience to a new neighborhood outside the stadium walls.